The Australian Museum is set to tour its annual science festival to Bathurst on the 12-13 November, offering a unique and engaging line up of hands on science activities for school audiences and the general public. Thanks to support from generous sponsors, all activities presented as part of the regional tour will be free! Charles Sturt University (CSU) will host this year’s rural leg of the festival that is designed to encourage attendees to learn and understand the science they see every day through hands on experiments and lively demonstrations. Australian Museum Science Communication Manager Catherine Beehag said that a scientifically literate community will help solve the challenges facing modern society. Festival organisers encourage all teachers in the area to take advantage of this opportunity to expose their students to a wide range of science activity that is not usually available in Bathurst. Featuring both a high school and primary school program, the festival this year will also be presenting a free, public event for the whole community. Panoramic Science kicks off at 5pm on the 12 November. “We always offer the general public a taste of some of the fun and educational activities the school students experience. Why should only school aged students get to have all the fun?” said Catherine. James Crane, a lecturer in physiology and anatomy in the CSU School of Biomedical Sciences in Bathurst, said the university is excited to play host to the Australian Museum’s Science Festival. “It offers primary and high school students, as well as the general public, an unparalleled opportunity to get hands-on and ‘do’ science. There really is something for everyone,” James added. As part of this festival, staff and students from the CSU’s paramedic program will be teaching CPR, performing a simulated vehicle extraction, and discussing the science behind paramedic practice and first aid. A forensic crime scene investigator workshop. 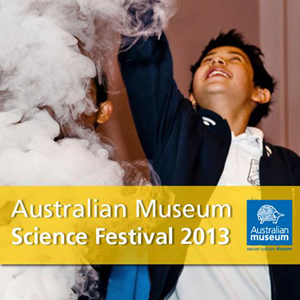 The Australia Museum’s Science Festival is a free event at CSU. The opening event at 5pm, 12 November will take place in the Mansfield Building (building C2). Other events will take place in the central quadrangle in front of the library and in adjacent buildings.